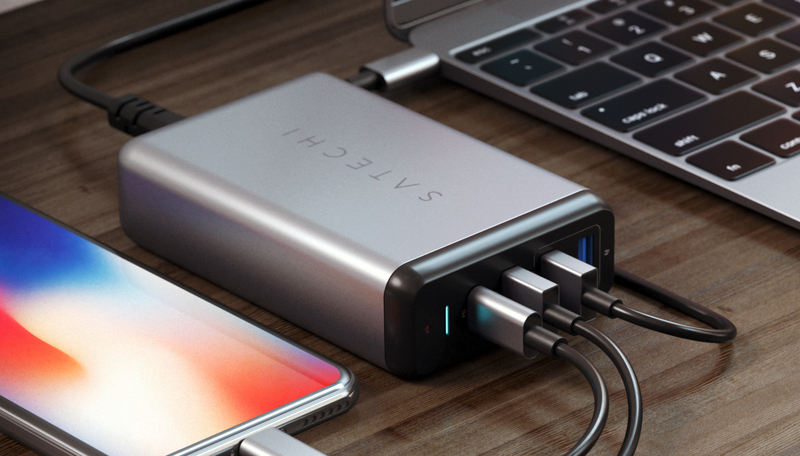 There have been a lot of announcements at this year's CES, but Satechi's latest Multiport Travel Charger caught our eye for one significant reason: it's able to deliver up to 75W of combined power, with 60W alone over USB-C. Not only is that enough to charge a MacBook Pro, but it's also among the highest wattage we've ever seen. Outside first-party units like Apple's massive 87W brick, there aren't many USB-C chargers that can deliver over 30W. There are a few that can hit 45W, like this one by Anker, and some 60W units from lesser-known companies like Nekteck and Grandstar exist, but this is the first one we've seen from any of the relatively bigger names. Outside the 60W USB-C charging capabilities, it also supports Qualcomm's Quick Charge 3.0 on one USB port, and 2.4A on two additional USB-A 3.0 ports, with a combined maximum 75W output. Satechi is charging $64.99 for the new charger, but it looks like you can pick one up now at Amazon for a slight discount at $59.99. at CES 2018. The sleek charger features four charging ports, including USB-C and Qualcomm Quick Charge 3.0, compatible with the newest generation of iPhone, iPad, MacBook Pro and MacBook, as well as, Nintendo Switch, Samsung Galaxy S8 and more. With Satechi's Type-C 75W Multiport Travel Charger, users can efficiently and safely charge up to four devices simultaneously (up to 75VV). The USB-C port (up to 60W) supports fast charging for iPhone X, 8 & 8 Plus and iPad Pro with an Apple USB-C to Lightning cable. Additional charging options include two USB-A 3.0 charging ports and a Qualcomm Quick Charge 3.0 port, which is 38% quicker and more efficient than Quick Charge 2.0. Designed for road warriors, frequent flyers and globe-trotters alike, Satechi's Type-C 75W Multiport Travel Charger features a broad input range (100-240V), suitable for voltage requirements in different countries. Its travel-friendly build fits easily into any luggage or backpack for convenient access to a portable charging station anytime, anywhere. 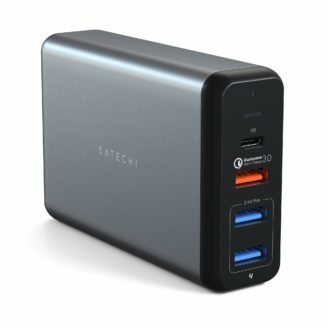 Satechi's Type-C 75W Multiport Travel Charger is available now in space gray for $64.99 at Satechi.net and Amazon.com. 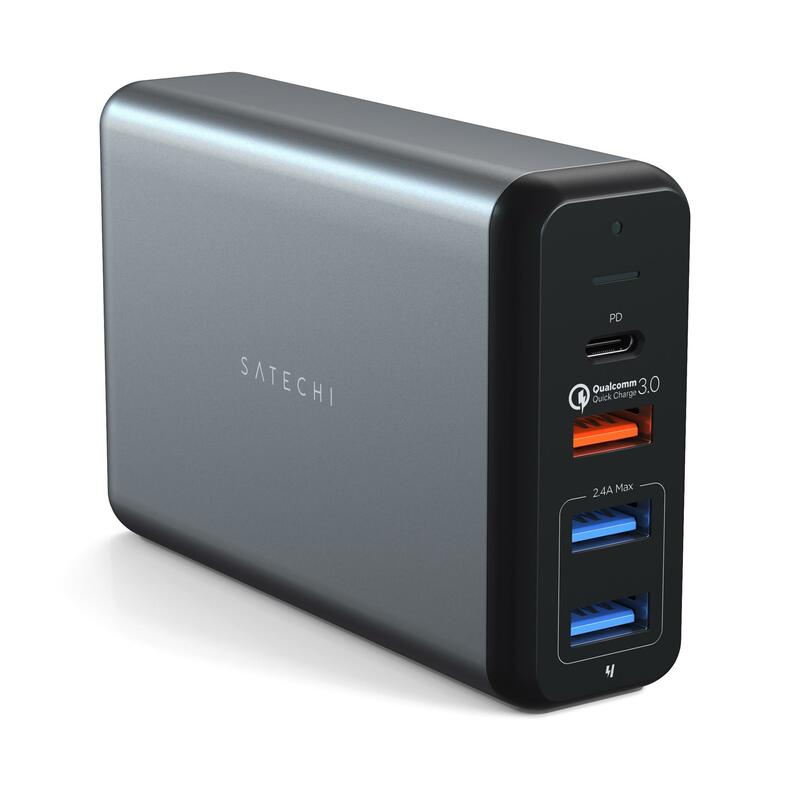 For more information on the Type-C 75W Multiport Travel Charger and all of Satechi's thoughtfully designed products, "like" Facebook.com/Satechi and follow @Satechi on Twitter and Instagram.